A service dog training program with a strengths-based perspective engages military members with PTSD and mild traumatic brain injuries who have not responded to traditional treatment methods. As the military works to find effective treatment strategies for the more than 500,000 members with PTSD and mild traumatic brain injuries (TBIs), the Warrior Canine Connection (WCC) program is showing great promise. Co-founded in 2011 by Meg Daley Olmert and Rick Yount, MS, LSW, a social worker certified in service dogs, the program combines animal-assisted therapy and a strengths-based approach in an innovative model that benefits military members with PTSD and mild TBI plus those who have become mobility impaired. WCC is a service dog training program that engages military members with PTSD and mild TBI who have not responded to traditional treatment methods in an intensive puppy-training program that results in a trained service dog for a mobility-impaired warrior. Building on the strengths-based perspective in social work and including an animal-assisted therapeutic model, WCC’s program is a cost-effective and nonpharmaceutical approach that has commanded the attention of many within the military mental health community. Since the mid-1990s, Dennis Saleebey, DSW, has been instrumental in fostering an alternative paradigm for social work practice. In contrast to the dominant approach to professional practice that focuses on problem identification and treatment, Saleebey supports a paradigm shift in which professional practice concentrates on the strengths of the people social workers serve. The strengths-based perspective requires a paradigm shift of such magnitude that it has been difficult for the profession to integrate. Because the fundamental principles of strengths-based practice challenge the time-honored ways of professional practice and confront the dominant systems of reimbursement for services, social work has tried to include elements of strengths-based practice within a problem-focused, client-deficits paradigm. Many funders’ need for DSM-based diagnosis and evidence-based practice for reimbursement perpetuates the paradigm’s dominance. Central to the strengths-based approach to practice is the principle of empowerment, emphasizing the discovery and use of resources that are within the individual, group, family, or community and those resources that exist within their environments. Social workers assist clients in identifying such resources through collaborative methods that validate and assist the client in harnessing these resources toward their goals. Much of the literature about the strengths-based perspective addresses incorporating the principles of strengths-based practice in direct service work with clients. At the macro-practice level, social workers can envision, plan, and implement programs that are inherently strengths based, incorporating the principles of strengths-based practice as integral components of program design. WCC is an example of a program that has been developed and implemented by a social worker committed to addressing the growing population of veterans and service members who currently are serving in the military and have developed PTSD and/or mild TBI. The WCC program grew out of Yount’s early social work experience working in the child welfare system where he recognized the soothing and therapeutic value of having his young Golden Retriever, Gabe, involved with the children he worked with in the foster care system. Subsequently, Yount obtained therapy dog certification for Gabe, enabling him to have Gabe with him at work on a regular basis. The effectiveness of animal-assisted approaches in working with traumatized foster care children was the catalyst for Yount’s continued professional development. In 2001, he implemented a program for public school dropouts that he had designed at the Alternative Learning Center in Morgantown, WV. Known as the Golden Rule Assistance Dog Program (GRAD), this program involved at-risk teenagers who were not succeeding in public school and had them participate in training service dogs. The program’s success, coupled with the fact that several of the dogs trained through the GRAD program were later paired with veterans with disabilities, convinced Yount of the efficacy of dog training programs for wounded warriors. He earned a master’s degree in assistance dog education from Bergin University of Canine Studies in Rohnert Park, CA. As part of his degree requirements, in 2008 he created the first warrior-dog training program aimed at treating PTSD and TBI among veterans. The program’s effectiveness drew the military’s attention, leading to an invitation in 2010 to design a service dog training program at the newly established National Intrepid Center of Excellence (NICoE). NICoE was established through the Intrepid Fallen Heroes Fund to “heal the invisible wounds of war” through “cutting-edge evaluation, treatment planning, research, and education for service members and their families dealing with the complex interactions of mild TBI and psychological health conditions,” according to the organization’s mission statement. NICoE serves active-duty service members with TBI, PTSD, and other psychological health conditions who have not responded to traditional therapies, and their families. WCC’s program design is grounded in the strengths-based paradigm posited by Saleebey. The program uses its own purpose-bred Labrador and Golden Retriever puppies, whose genetics and temperaments are carefully researched and controlled by dog program director Molly Morelli. After an intensive eight- to 12-week period of socialization and preliminary training, the puppies go to NICoE and other similar military treatment sites to be trained by service members with PTSD and TBI, who volunteer for this program as part of their treatment. These service members are training the puppies for eventual pairing as service dogs for veterans with mobility impairments. This draws heavily on one of the key strengths of the service members: connection to the military through the warrior ethos. The warrior ethos, as described by the Army, is that “I will always place the mission first. I will never accept defeat. I will never quit. I will never leave a fallen comrade.” Each aspect of this ethos is central to the service dog training program. The service dog’s preparation is the mission, and it must be accomplished because it serves the real needs of a “fallen comrade” who has mobility impairment during his or her service. As a result of building on the strength of the warrior ethos, service members with PTSD and TBI become committed to the successful training of WCC’s puppies. Armed with this commitment, participating service members join a service dog training program that requires them to engage in activities that address core symptoms of PTSD and mild TBI, including reexperiencing, avoidance and numbing, and arousal. This is accomplished by the emphasis in training procedures on the dog’s “here and now” perspective, especially during stressful events that may be encountered during training. The service member/trainer must remain in the moment and respond to the dog’s needs, decreasing the tendency to reexperience. The dogs must be taught that the world is a safe place, even as circumstances may seem threatening. This is related to the issue of arousal, as aspects of the environment, such as car backfires, sirens, and other potential triggers of symptoms, must be tolerated by the trainer to reassure the dog that nothing is wrong. If the trainer is negatively aroused, the puppy’s presence can lower anxiety levels. The tendency to self-isolate and avoid socialization is directly addressed by the service dog training program. Training service dogs requires substantial interactions within the community. Veterans with mobility impairment will eventually use service dogs in every aspect of their lives. Restaurants, shopping malls, subways, airports, public parks, city streets, hospitals, and many other places must be familiar to service dogs so they can effectively serve their mobility-impaired warrior. Familiarizing the young dogs with these places is a crucial aspect of the training program, requiring the trainers to carefully expose the dogs to these environments. As the service members introduce the dogs to these settings, they are confronting their self-isolation tendencies. The dog’s presence has been described as a “social lubricant,” as people in these environments focus on the dog rather than on the service member training the dog. Staff members of WCC’s program accompany service member trainers in these activities, supporting and assisting as necessary. Service members’ commitment to the strength of the warrior ethos enables them to fulfill the roles required of a trainer, even as these roles may contradict their residual feelings from psychological injury. Training the dog requires the establishment of a close bond between the trainer and the dog, making emotional numbness impossible. The trainer must use a heightened tone of voice, pronounced body gestures, self-confidence, patience, and positive emotional feedback. These behaviors may be difficult for the service members until their commitment to the mission enables them to adopt the behaviors effectively. Early on it has been noted that the service members may be acting out the required behaviors but not actually integrating them, called “fake it until you make it” among WCC’s program leaders. The program results demonstrate that a large proportion of the trainers do, in fact, make it, integrating these behaviors effectively and ameliorating, if not eliminating, the self-destructive symptoms of PTSD and mild TBI. To date, anecdotal evidence of the effectiveness of WCC’s service dog training program is overwhelming. Participating warriors report improvements in their emotional state, impulse control, ability to sleep, sense of belonging and acceptance, sense of self-worth, assertiveness, and family dynamics, especially in parenting efficacy (Yount, Olmert, & Lee, 2012). Studies are under way to scientifically demonstrate the results of WCC’s program with the goal of establishing it as an evidence-based intervention. WCC’s program is grounded in theory and science. The recent publicity focusing on the use of animals, especially dogs, in providing emotional well-being for people, has reawakened interest in this subject among professionals and the public. Therapy dogs were featured as a response to the emotional needs of both the Boston and Newtown, CT, communities after their respective recent traumatic events. Additionally, reports of universities bringing dogs to locations such as campus libraries to ease the anxieties of students facing final exams have been well publicized. This renewed emphasis on the use of animals belies a long history of exploration of the human-animal bond in the treatment of mental health problems. Some trace this history to the late 1600s when John Locke linked small pets to the development of empathy in children, followed in the 1800s by Florence Nightingale’s association of small animals and a reduction of depression (Fine, 2010). Freud is reported to have noted a positive impact on his psychotherapy practice when his dog was in the office with him (Fine). In the 1960s, Boris Levinson presented a session at the American Psychological Association annual meeting on the topic of animal-assisted therapy (Fine). In the 1970s, two important organizations were established: Therapy Dogs International and the Delta Foundation, which became the Delta Society in 1981 and changed its name to Pet Partners in 2012. The Delta Society clarified the definition of terms used in animal interventions, defining animal-assisted activities as those that use specially trained professionals, paraprofessionals, or volunteers to provide opportunities for motivational, educational, recreational, and/or therapeutic benefits to enhance the quality of life in various settings without setting specific goals (Shubert, 2012). Animal-assisted therapy was defined as an intervention, delivered by a health/human service professional with specialized expertise, in which an animal that meets specific criteria is an integral part of the treatment process. Specified goals and objectives are established and measured for each participant (Shubert, 2012). WCC’s service dog training program meets the definition of animal-assisted therapy. Responding to the need for theoretical frameworks to develop and further study animal-assisted therapy, Kruger and Serpell (in Fine) identified a set of theories that specifically include animal training: cognitive, social cognitive, and role. In cognitive and social cognitive theories, changes in behavior are achieved by “positive changes in a person’s self-perceptions” (Kruger & Serpell in Fine, 2010). Role theory posits that as people take on new roles, behavior is modified to meet the expectations of these roles. These theories are evident in the WCC’s service dog training program. 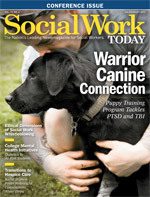 Warriors who are training service dogs move from negative self-perceptions based on their PTSD and/or TBI symptoms to positive self-perceptions through their contributions to the mission of helping fellow warriors who need service dogs and by the immediate positive feedback from daily interactions with the dog. Role theory is evident as warriors training service dogs are required to adopt the behaviors of effective dog trainers—behaviors that counteract the deleterious symptoms of PTSD and mild TBI. Scientific evidence underpinning the WCC program derives from several sources. Fine notes that the work of Alan Beck and Aaron Katcher, authors of the book Between Pets and People: The Importance of Animal Companionship, demonstrating positive physiological benefits from interaction with or in the presence of a dog, met the gold standard for scientific evidence. Lowered stress levels, reflected by more regular breathing, slowed heart beat, relaxed muscles, and other changes in the sympathetic nervous system, provided evidence for animal-assisted therapy. Additional evidence has emerged from the field of neurobiology in examining the human-animal bond (Handlin, Hydbring-Sandberg, Nilsson, Ejdebac, Jansson, & Uvnas-Moberg, 2011). Studies have shown that human-dog interactions, such as playing, petting, and talking, produce a significant change in oxytocin levels in the brain. Oxytocin is known to act positively on anxiety, interpersonal problems, social isolation, and sleep disturbances. The 2009 book Made for Each Other: The Biology of the Human-Animal Bond by WCC cofounder Olmert explores the role of increased oxytocin in the brain. The theoretical and scientific underpinnings of the WCC service dog training program are established but considered insufficient for designation as an evidence-based practice by the military. Studies that further document the results of the program in effectively remediating the symptoms of PTSD and mild TBI are under way in an effort to gain the support necessary to expand this program to more warriors with psychological injuries. Among the more than 100 service members who have participated in WCC’s program, no further proof is needed. The majority of these participants credit the program with turning their lives around; improving their relationships with spouses, partners, and children; and enabling them to resume fulfilling lives. With more than 500,000 veterans receiving benefits and services for PTSD, designation of the WCC program as an evidence-based intervention, supported by the military, cannot come soon enough. Fine, A. H. (2010). Handbook on Animal-Assisted Therapy. 3rd edition. San Diego, CA: Elsevier. Handlin, L., Hydbring-Sandberg, E., Nilsson, A., Ejdebac, M., Jansson, A., & Uvnas-Moberg, K. (2011). Short term interaction between dogs and their owners: effects of oxytocin, cortisol, insulin and heart rate. Anthrozoos, 24(3), 301-315. Saleebey, D. (2013). The Strengths Perspective in Social Work Practice. 6th edition. Upper Saddle River, NJ: Pearson. Shubert, J. (2012). Dogs and human health/mental health: from the pleasure of their company to the benefits of their assistance. The Army Medical Department Journal, 21-29. Yount, R. A., Olmert, M. D., & Lee, M. R. (2012). Service dog training program for treatment of posttraumatic stress in service members. The Army Medical Department Journal, 63-69.